Designed to lead the coolant along the edge of the cutting tool, providing you with an easy way to achieve peripheral cooling. For applications up to 150 bar. Protects against all kind of dirt and chips entering the slots of the collet. Quick change of sealing disks according to required tool shank diameter. 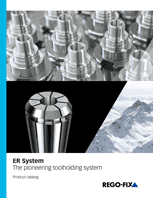 Our long-lasting machining experience results in a well-engineered system. 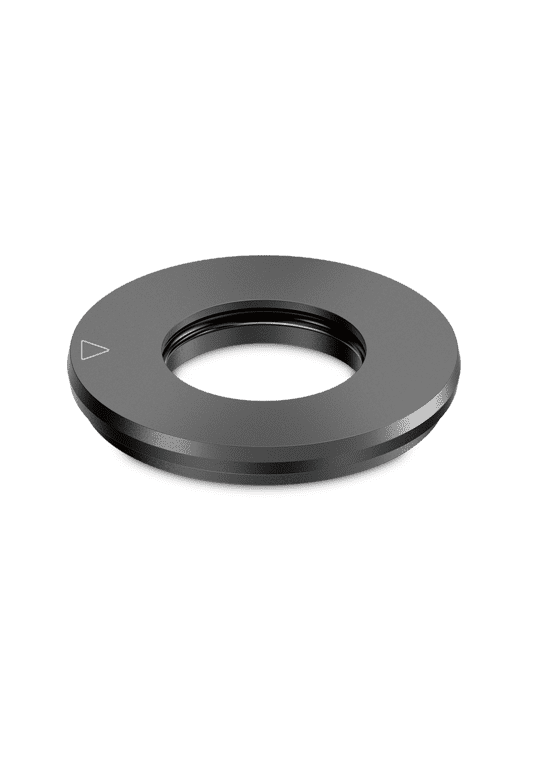 When buying coolant flush disks please pay attention to the REGO-FIX quality seal on the coolant flush disk: The triangle is our seal for outstanding quality made in Switzerland. O-ring for aggressive coolant (VITON-quality). For better cooling and lubrication. Extends tool life and supports chip removal. The disk must be flush with the outside of the nut and the marking on the disk must be visible inside of the nut. Insert tool with the shank side first. O-ring might be damaged if cutting tool is inserted from the back with the cutting edge side. 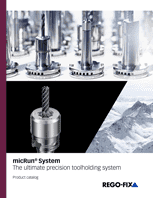 It has never been easier to achieve toolholding excellence. Request a quote for your selected products today! DS / ER 40 Ø 25.5 mm / 1"
DS / ER 40 Ø 25.0 mm / 31/32"
DS / ER 40 Ø 24.0 mm / 15/16"
DS / ER 40 Ø 23.0 mm / 29/32"
DS / ER 40 Ø 21.5 mm / 25/32"
DS / ER 40 Ø 22.5 mm / 7/8"
DS / ER 40 Ø 21.0 mm / 13/16"
DS / ER 40 Ø 19.0 mm / 3/4"
DS / ER 40 Ø 20.0 mm / 23/32"
DS / ER 40 Ø 17.5 mm / 11/16"
DS / ER 40 Ø 18.5 mm / 23/32"
DS / ER 40 Ø 16.0 mm / 5/8"
DS / ER 40 Ø 17.0 mm / 21/32"
DS / ER 40 Ø 15.5 mm / 19/32"
DS / ER 40 Ø 13.0 mm / 1/2"
DS / ER 40 Ø 13.5 mm / 17/32"
DS / ER 40 Ø 11.5 mm / 7/16"
DS / ER 40 Ø 12.0 mm / 15/32"
DS / ER 40 Ø 10.5 mm / 13/32"
DS / ER 40 Ø 9.0 mm / 11/32"
DS / ER 40 Ø 9.5 mm / 3/8"
DS / ER 40 Ø 7.5 mm / 9/32"
DS / ER 40 Ø 8.0 mm / 5/16"
DS / ER 40 Ø 6.5 mm / 1/4"
DS / ER 40 Ø 5.0 mm / 3/16"
DS / ER 40 Ø 5.5 mm / 7/32"
DS / ER 40 Ø 3.5 mm / 1/8"
DS / ER 40 Ø 4.0 mm / 5/32"
DS / ER 40 Ø 3.0 mm / 3/32"
DS / ER 20 Ø 12.0 mm / 15/32"
DS / ER 20 Ø 13.0 mm / 1/2"
DS / ER 20 Ø 11.5 mm / 7/16"
DS / ER 20 Ø 10.5 mm / 13/32"
DS / ER 20 Ø 9.5 mm / 3/8"
DS / ER 20 Ø 9.0 mm / 11/32"
DS / ER 20 Ø 8.0 mm / 5/16"
DS / ER 20 Ø 6.5 mm / 1/4"
DS / ER 20 Ø 7.5 mm / 9/32"
DS / ER 20 Ø 5.0 mm / 3/16"
DS / ER 20 Ø 5.5 mm / 7/32"
DS / ER 20 Ø 3.5 mm / 1/8"
DS / ER 20 Ø 4.0 mm / 5/32"
DS / ER 20 Ø 3.0 mm / 3/32"